We're off at a gallop with round two of the Design Team makes for Nikki's 'Numbers' challenge and here is the lady herself with her next project to share with us. I have to say that with the sunburst effect, the gorgeous colours and the lovely flower and sentiment,Nikki is looking to hold onto the summer for a bit longer too. I used one of my favourite techniques on this tag - heat embossing through a stencil to 'protect' some of the surface before covering the rest in black ink. For all the details on this and the painted flowers and numbers I would love to see you over at Addicted to Art today. Thanks Nikki, this is a beautiful tag and that embossing 'shines' through. 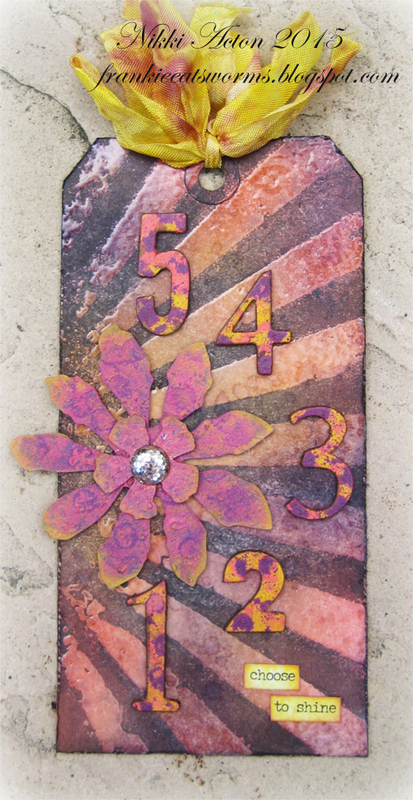 So after you've popped over to see the details for Nikki's tag I hope you will be creating a numbers project and popping back to the challenge blog (link in the sidebar) to share with us. We'll be back again on Saturday with another DT member sharing her second sample with you. So until then 'Happy Crafting'.